Unlike beaches cluttered with hotels and busy public beaches, Rincon has retained its surfside charm. Rincon is known for its world class surfing and excellent beaches. 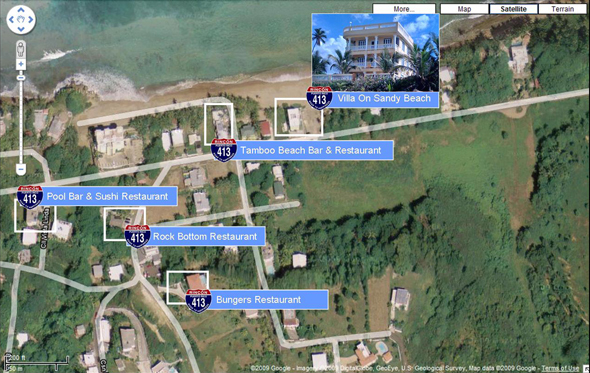 The Sandy Beach area of Rincon is known as the Fun Coast (Click Here to learn more about the Fun Coast) and has an energetic "vibe" with laid back restaurants and shops. Swimming, relaxing, deep sea fishing, diving, cycling are all available locally. Plus, the Villa On Sandy Beach serves as a perfect home base for daily excursions to the mountains and all that western Puerto Rico has to offer. We strive to provide guests with a hassle free vacation. Before you travel, we will send you a preprogrammed GPS to make travel to the villa a breeze and once you arrive, make it easy to find destinations such as restaurants, groceries, pharmacies in the area. We will also stock the fridge with complimentary snacks until you can get to the grocery. With gorgeous oceanfront views, 3 bedrooms, 2 bathrooms and plenty of space to relax, you'll never want to leave!